Lugnuts Special Nights Rock Your Summer! Summer in Greater Lansing is an awesome time. Concerts and farmer&apos;s markets and a kayak ride down the grand river makes it a special place when the sun is out. However my favorite part about the Capital City in the summer is the Lansing Lugnuts. 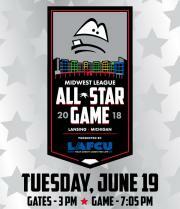 Our team is the Class A affiliate of the Toronto Blue Jays and will serve as hosts for the 2018 Midwest League All Star Game on June 19th at 7:05 p.m.
Before the game the Lugnuts are holding a special party for the attendees that are sure to be coming from all over the midwest. This block party is free from 3 to 6 p.m. and includes chalk art on the sidewalks, a ferris wheel, climbing inflatables, a fun house and a visit from Humphrie the Camel as well as Big Lug, of course. This all star game has down-to-earth pricing with all tickets just $15. And what a great way to see up-and-coming talent from around the Midwest! After all these are tomorrows major leagers. Someday you can say you saw them back when they were just coming up! This will be a night of all-star baseball that will set your summer off with a tone of fun like you haven&apos;t had in years. Greater Lansing is so lucky to have the Lansing Lugnuts. Sure, there are minor league teams all over the state and the country offering professional baseball feel at a fair price but I honestly believe the Lugnuts are special. They work so hard to make the experience about more than baseball. More than just hits and strikes and the late-game pitching change. They have so many fun theme nights they get people walking in the door that don&apos;t even care about baseball! How&apos;s that for creative marketing!? They have special days where your dog can come to the game with you. Or how about Dollar days where great concessions like hot dogs, beers, fountain pop, ice cream sandwiches and popcorn are just one dollar each! Maybe you&apos;d want to check out Winning Wednesday? That&apos;s where if the Lugnuts win, you get a free ticket to come back and see them play again! Where else in the world of sports are you going to get something like that? Want some specifics on my upcoming favorite special theme nights? 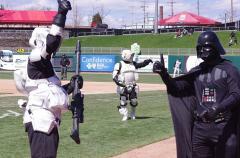 Come dressed as Chewbacca or Yoda for Star Wars night on June 16th! Grab your broom and wand and your house colors on June 23rd for Harry Potter Night. These two are my favories but it&apos;s just the beginning. There are special theme nights all through the summer! Visit the Lansing Lugnuts website for more information and plan your special night!